The Japanese Army established in 1919 the Tachiarai Air Base, located in Fukuoka Prefecture on Japan's southernmost main island of Kyushu. The Tachiarai Army Flight School opened in 1940 and trained many pilots who took part in kamikaze operations in the last year of the war (Miwa 1998, 3, 9-10). The Tachiarai Flight School had a branch school in Chiran (Kagoshima Prefecture), where many Army pilots departed to make suicide attacks on the American fleet near Okinawa. Operations at Tachiarai came to an end when American B-29s destroyed the base on March 27, 1945. Mr. Muneshige Fuchigami opened the Tachiarai Peace Museum in 1987 and continues as the museum's director. He selected the former Tachiarai train station as the museum site because he wanted to preserve the place where families gave their final farewells to young men departing for the battlefront (Nishinippon Shimbun 2000). Since the museum's opening, numerous individuals have donated items about the air base and the personnel who were stationed there. The museum's goals, as stated in its brochure, are to preserve peace and to maintain repose of the souls of those who died during the war. The main exhibition room has an altar in one corner in remembrance of those who died. The main exhibit room displays a few letters and other items of kamikaze pilots who died in battle. One case has photos of about 50 kamikaze pilots from Tachiarai Air Base and includes the following information on each pilot: name, unit, plane used, date of death, and air base of final sortie. Most pilots sortied from the Army air bases in Chiran, Bansei, and Miyakonojo in Kagoshima Prefecture, the southernmost prefecture of mainland Japan. The museum does not give any historical summary of the kamikaze operations but rather focuses on the stories of the pilots stationed at Tachiarai Air Base. The only remaining Army Type 97 fighter plane in the world is displayed in the back room (see photo at left). 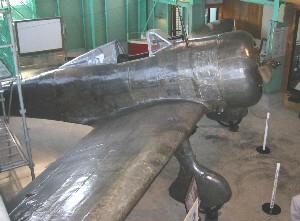 The Army used this type of plane on many kamikaze missions, and the museum's plane has a replica bomb attached underneath like the one used in attacks. The plane was discovered in 1996 at the bottom of Hakata Bay next to Fukuoka City, and it has been on display at the museum since its restoration. This plane had crashed in 1945 into the bay in route from Manchuria to Chiran Air Base after an order had been received for it to be used in a kamikaze attack. The pilot survived the crash but later sortied from Chiran and died in a kamikaze attack using the same type of plane. In addition to the Type 97 fighter plane, the museum has mounted outside a T-33 training jet plane produced after the end of the war. Besides photos, maps, and other articles related to the Tachiarai Air Base, the museum contains an immense variety of items related to Japanese military and civilian life during the war. One display case shows different medals awarded to soldiers who died in battle. Models and paintings of planes are spread throughout the museum, and several exhibits display military uniforms and other clothing. In places the museum resembles a packed antique shop, with such items as wartime money, matches, a clothespin, tires, radios, a ceramic pump, school desks, and even a tank used for a charcoal-burning car. Going to the small town of Tachiarai takes over one hour by local train, with one transfer, from the main station in Fukuoka City. No information at the museum is in English. Admission costs 500 yen ($4.50), and the museum provides visitors with a small brochure that includes photos of several exhibits. The museum sells a book about the Tachiarai Air Base, which includes photos of the base and several articles by people in Tachiarai when the base was in operation and when it was bombed. Miwa Town, Fukuoka Prefecture. 1998. 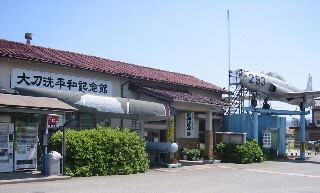 Shougen: Tachiarai Hikoujou (Evidence: Tachiarai Air Base). Miwa Town: Miwa Town. Nishinippon Shimbun. 2000. Tachiarai Heiwa Kinenkan (Tachiarai Peace Museum). August 9. <http://www.nishinippon.co.jp/media/news/0008/museum/18/18.html> (May 12, 2004), link no longer available.